BlackBerry Limited (NASDAQ:BBRY)(TSX:BB), a global leader in mobile communications, today launched the BlackBerry® Leap, an affordable all-touch smartphone in a modern and powerful design for 4G LTE networks in Canada. The BlackBerry Leap is designed for consumers and enterprise users who value security and privacy when pushing their productivity to the next level. The new BlackBerry Leap will be available from Bell Mobility, Rogers Wireless, Sasktel, TELUS, WIND Mobile, ShopBlackBerry, and select Tbooth wireless and WIRELESSWAVE locations starting on May 7th, 2015, for as low as $0.00 on contract1. A variety of accessories including cases, carrying solutions, chargers, and audio peripherals, are also available through the carrier partners or ShopBlackBerry. BlackBerry has also introduced three new Accessory Value Bundles that include an unlocked BlackBerry Leap with accessories for additional savings. The BlackBerry Leap Efficiency Bundle, BlackBerry Leap Travel Bundle and BlackBerry Leap Power Bundle are available today on ShopBlackBerry. "With the introduction of the BlackBerry Leap to the BlackBerry 10 portfolio we continue to provide products and services that meet the needs of consumers and enterprise customers in Canada," said Jaime Leverton, Vice President, Carriers for BlackBerry. "The BlackBerry Leap is an affordable all-touch smartphone in a modern and powerful design that is built for career builders and companies who value security and privacy when being productive." 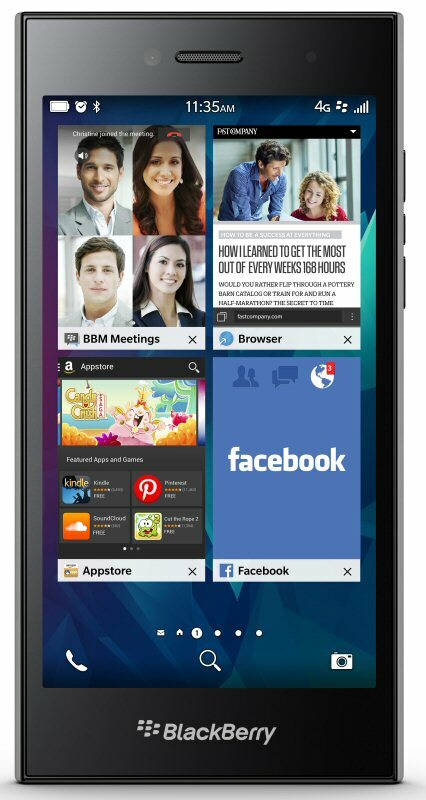 BlackBerry Leap features the latest BlackBerry® 10.3.1 operating system, a brilliant edge-to-edge five-inch HD display and more than a full day's battery power, keeping users hyper connected, productive and always in control. Security to Maintain Privacy - You can feel safe in the knowledge that BlackBerry Leap was designed with the highest standards of security in mind to protect your privacy. It is equipped with support for encryption, plus built-in malware protection and back-up, wipe and restore. All to give you control and help secure your data against the next embarrassing and potentially costly cyberattack. Battery That Powers Through a Full Day - With up to 25 hours of heavy use,2 the BlackBerry Leap will power through even your most demanding day. The impressive 2800 mAh battery and optimization of power consumption in BlackBerry 10 gives users more than a full day of productive usage. Best-in-Class BlackBerry Keyboard - Type faster and more accurately on a touchscreen keyboard that learns how you write. With superior error correction, multi-language support, customized adaption and flow, BlackBerry's touchscreen keyboard helps to reduce the mistakes and missteps that can hold you back. 2 Based on GSMA PRD TW.09 Battery Life Measurement Technique and a mixed usage scenario. Many factors affect battery life, including network connectivity, application usage, feature configuration and battery age. Actual results may vary. contacts and media in real time on whatever device you are on, powered by your BlackBerry. BlackBerry Blend works across desktop operating systems, including Mac OS X 10.7 +, Windows® 7+ and Android™ tablets running Android 4.4+ via cellular, USB or Wi-Fi connections. BlackBerry® Assistant - The BlackBerry Assistant is BlackBerry's first digital assistant and can be used with voice and text commands to help users manage work and personal email, contacts, calendar and other native BlackBerry 10 applications. It's the only smartphone assistant on the market today that can access both personal and work content in your work perimeter. BlackBerry Assistant intelligently determines how to respond to you based on how you interact with it - if you type, it responds silently, if you speak, it speaks back and if you activate over Bluetooth, it speaks back with additional context because it assumes you might not have access to the screen.